The fastest-selling Triumph motorcycle in history has been in showrooms for around a year now. 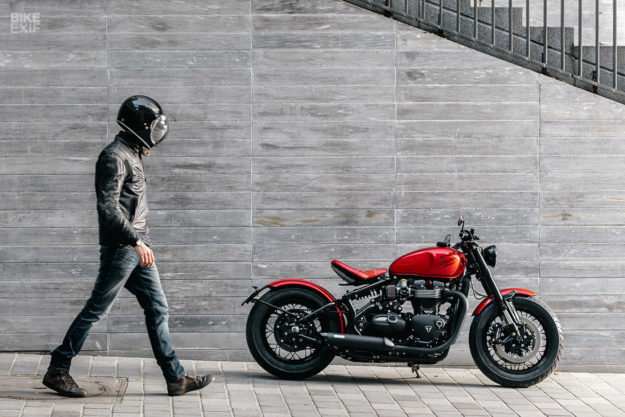 But we haven’t seen many custom jobs, because the Bonneville Bobber does everything very well—except carry passengers, for which we have the new Speedmaster. But if you’ve got a Bobber and have an itch to modify it, let Modification Motorcycles of Paris be your guide. 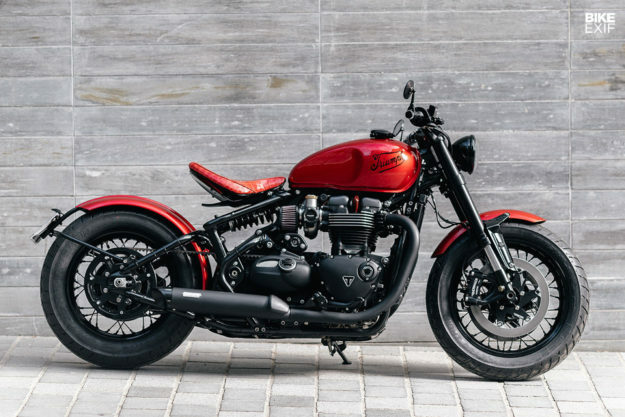 Raphael, Florian and Morgan have spent five months subtly tweaking a Triumph Bobber to give it an extra performance edge—and a not-so-subtle dash of style. 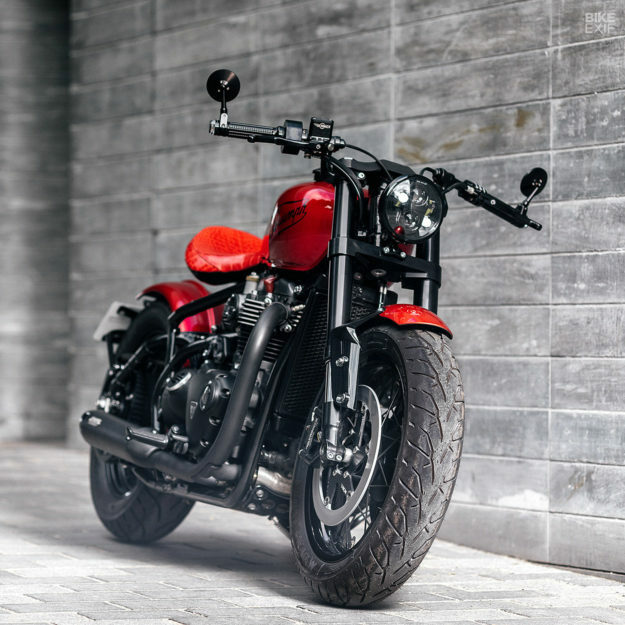 Working with their client, Modification Motorcycles decided to take a ‘factory custom’ approach: what would Triumph themselves do if they were to build a one-off suitable for daily use? It turned out to be a rather more complex process than les gars originally anticipated. 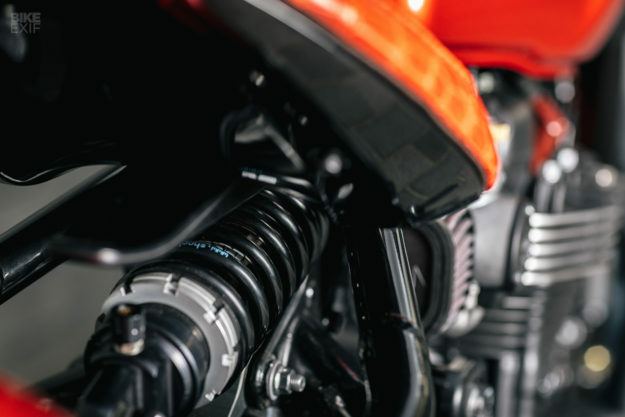 It was not a plug-and-play operation to make the high-performance front end fit the Bobber frame: a new set of triple tees was CNC machined up, with inserts to accommodate a Motogadget Motoscope mini speedo and idiot lights. It’s a functional yet minimalist dashboard. The original headlight bowl remains, but it’s now filled with an LED lamp. The handlebars were a little harder to finish: they needed to keep the ride-by-wire cabling and module essential for the traction control, drive modes and on-board computer functions. 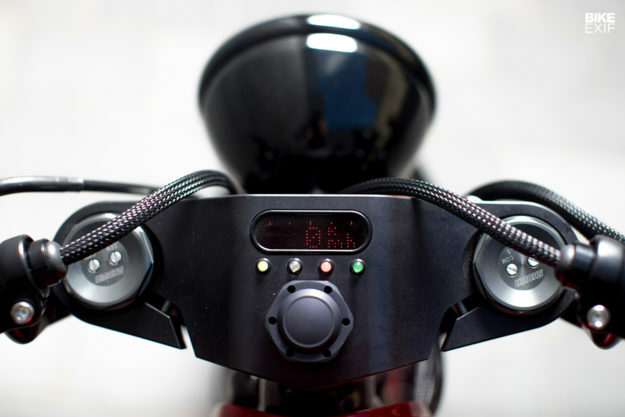 The electrics have been upgraded with a full Motogadget set, from mini-buttons to mirrors and bar-end turn signals. “The braking had to be French though,” says Raphael. Next up on the list was a rewire. The panels under the seat are gone, giving the Bobber a much lighter look when viewed from the side. The effort was worth it: the beautiful rear linkage arrangement is now on view, complete with a custom shock specifically developed for the build by Shock Factory. 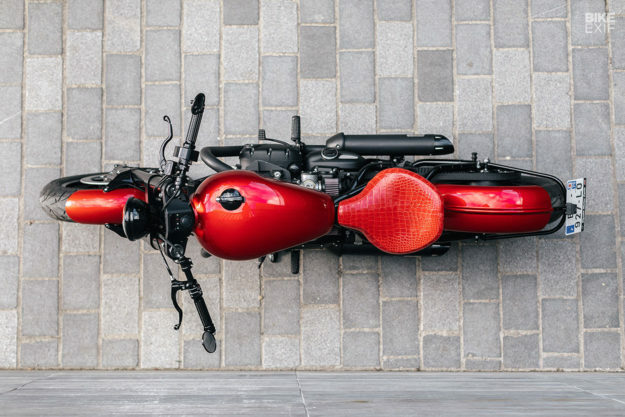 A slightly bobbed rear fender accentuates the look. 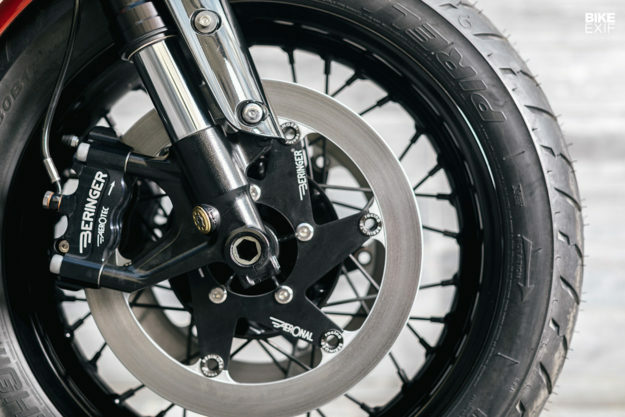 Close inspection reveals a belt drive conversion, which we’ve never seen before on the Bobber. 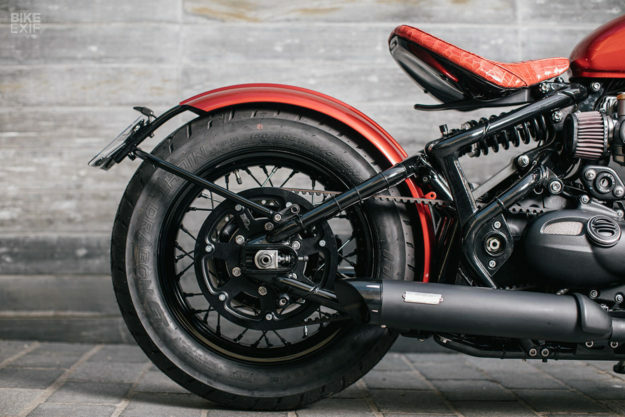 “It’s an excellent kit produced by FreeSpirits that gives the bike a custom touch, and a very soft launch from standstill, even in low revs,” says Raphael. The Vance & Hines pipes are straight from the Triumph accessory parts list. They sound terrific, fit easily, and comply with noise regulations—perfect for the regular use this Bobber will see. The paint is most definitely not from a catalog, though. Much of the existing metalwork on the Bobber has been blacked out, echoing Triumph’s own Bobber Black, and the paint gets its depth from three layers of black flake under the top coats. Depending on the light and angle, the shade changes from a deep cherry red to a dark orange. 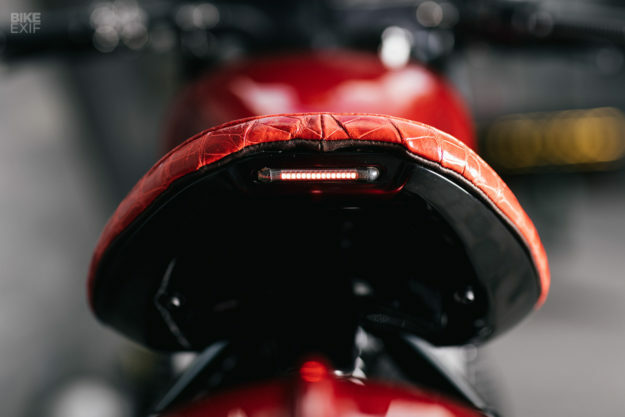 “Without it, the bike would be so plain and neat: it adds the extra madness that we needed.” It’s also added a bit of extra technology, because there’s a tiny LED strip running across the back of the seat. 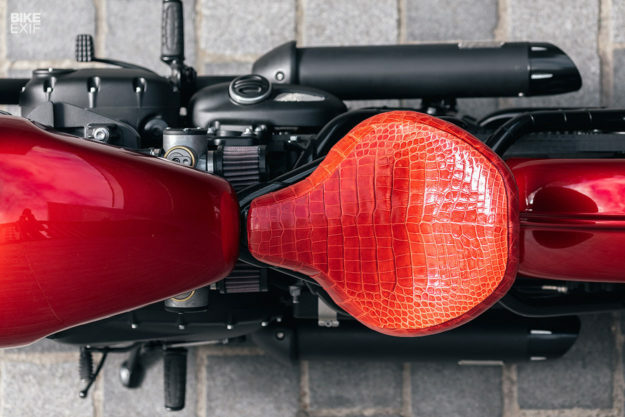 Modification Motorcycles’ Bobber is close to being a perfect ‘real-world’ custom: an already good platform given a boost in style and handling, without compromising usability.